I've already made grilled prime rib for two, and it turned out great. But the weather's a little unpredictable for grilling right now. So I decided to use my favourite cast iron pan to sear and quickly roast this little prime rib. 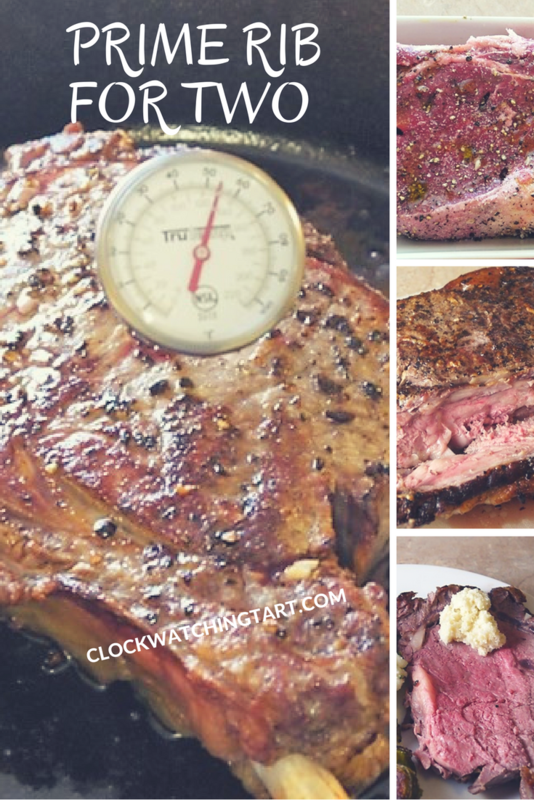 This prime rib has just one bone and weighed just over two pounds. I seasoned it by cutting little slits all over the meat and stuffing them each with a thinly sliced garlic clove. Then I seasoned it all over with salt and pepper. And then I rubbed a little olive oil on the meat. Then I let it sit for a little while while I preheated the oven to 400 degrees. I heated my cast iron pan and seared the roast for about two minutes. I flipped it over and seared the other side for just a minute before popping it into the oven. I roasted it for 10 minutes at 400 and then turned the oven down to 225 degrees and roasted it about 20 minutes more. Then I pulled it out and checked the temperature. I wanted it about 130 degrees for medium rare but it was closer to 140 (medium) I removed it to a platter and covered it to rest while I made some jus. I poured about a cup of beef broth and a half a cup of red wine into the pan and let it simmer until reduced by about half. Once it was rested, I cut the bone of the beef. I threw the bone in the freezer to use later for stock. Then I sliced the beef into four thin-ish slices. I served this beef with my home made horseradish, mashed potatoes with chives and roasted brussels sprouts. And the jus. There were leftovers, but I'll show you what to do with them soon! Slice the garlic thinly and cut small slits in the roast. Insert the garlic. Season the meat all over with salt and pepper, drizzle with olive oil. Heat a cast iron pan over medium heat. Sear the roast on all sides. 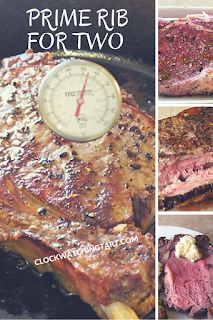 Roast for 10 minutes at 400 degrees, then reduce oven temperature to 225 degrees and roast about 20 minutes more until a thermometer reads 130 degrees for medium rare. Remove to a platter and cover to rest. Meanwhile, add stock and red wine to the pan and simmer to reduce by half for the jus. Slice the prime rib and serve with jus and horseradish.